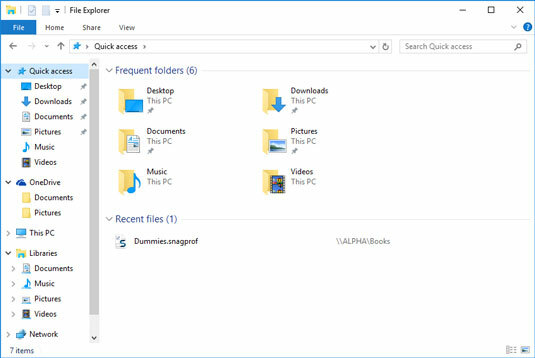 When you bring up File Explorer in Windows 10, you’re placed in a make-believe folder called Quick Access, which consists of folders that you have pinned, or that have been pinned for you (Desktop, Documents, Downloads, Music, Pictures, Videos). File Explorer shows your most frequently used folders on top and recently used files on the bottom. The original File Explorer layout. If you’ve used Windows 7 or 8, you probably wondered what happened to your libraries — they used to appear on the left side of the screen as links to the Documents, Music, Pictures, and Videos libraries. Instead, you get the six folders (not libraries) listed at the top of the figure. Open File Explorer. Click the View tab. You see the ribbon shown here. Have File Explorer show you libraries. Click or tap the large Navigation Pane icon on the left, and select Show Libraries. Your four default libraries appear on the left, as shown. Unfortunately, you aren’t finished yet. 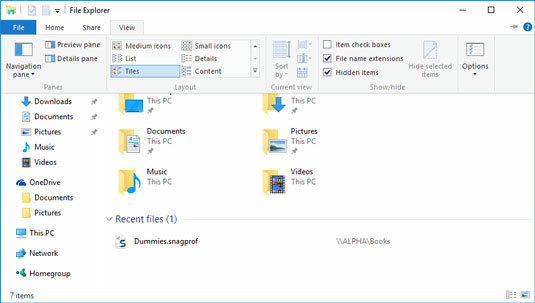 One of the most important features of libraries in Windows 7 and 8 was their capability to hook into the Public folders on your computer. The Public folders are a good place to put files that you want to share with other people on your computer or other people on your network. 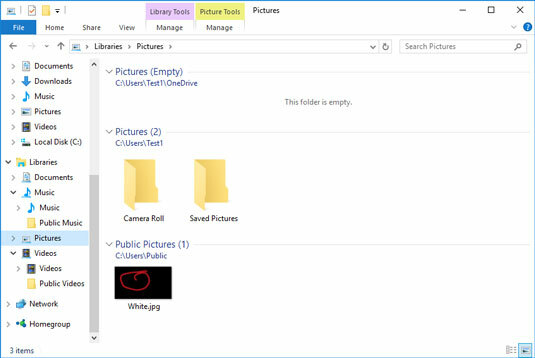 In Windows 10, the default libraries aren’t hooked up to the Public folders of the same type. Swear once or twice at Microsoft, and roll your Public folders into your libraries. In File Explorer, navigate to your Public Documents folder. To do so, double-click This PC, double-click Local Disk (C:), double-click Users, and then double-click Public. After all that double-clicking, you should come to a screen that looks like the one shown here. Add the Public Documents folder to your Documents library. Right-click the Public Documents folder, choose Include in Library, and then choose Documents. 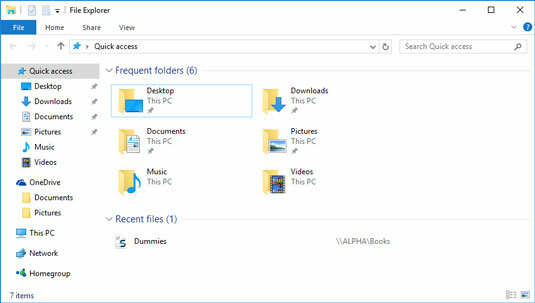 Windows 10 reluctantly puts your Public Documents folder where it belongs. Repeat the steps for the Public Music folder (put it in the Music library), the Public Pictures folder (in Pictures), and the Public Videos folder (in Videos). 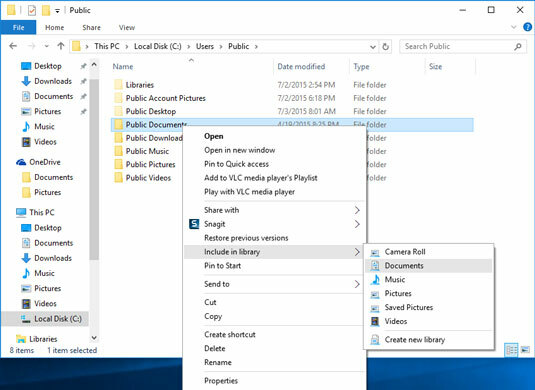 Close File Explorer (click the X in the upper-right corner), and restart it. Verify that all the Public folders now appear in their correct libraries, as shown here. Give Microsoft a little epithet for that one. Public folders now appear where they should’ve been in the first place.